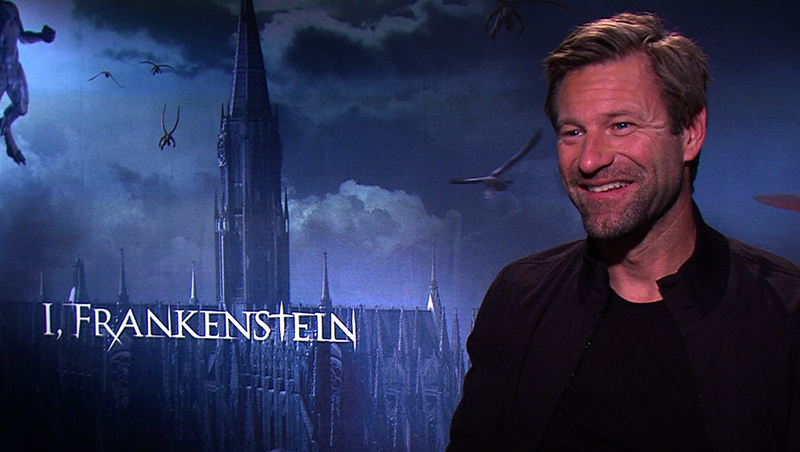 Aaron Eckhart on Kali stick training for "I, Frankenstein"
Aaron Eckhart is taking on some pretty big literary shoes with his latest role in "I, Frankenstein." The Golden Globe-nominated actor stars as the eponymous monster in this modern spin on Mary Shelly's now-legendary 1818 story. Here called "Adam," Eckhart plays Frankenstein's monster in the present day, as he goes up against demonic forces with the help of gargoyles ruled by Leonore (Miranda Otto). The film also stars Bill Nighy, and "Dexter" actress Yvonne Strahovski, as a scientist skeptical at first of the Frankenstein myth. For his physically-demanding role, Eckhart spent over six months studying Kali stick fighting, which falls under the Filipino martial arts known as Eskrima. "I didn't know anything about it," Eckhart said in an interview for CBS News. "I had never heard of it before…And it's a very complicated discipline. Very dangerous. So we really had to work out and choreograph our dance with the other actors and the stuntmen so we didn't kill each other on a daily basis." Eckhart also revealed that he was "knocked out a couple of times" during filming. Watch the video above to hear Eckhart describe how he felt portraying such a famous character, and to hear Strahovski discuss how she learned how to suture skin together in preparation for her role. "I, Frannkenstein" opens in theaters on Friday.